When I was a kid, growing up in the American South, the day we now call Memorial Day was called Decoration Day. Families went to the local cemeteries to clean up the grave sites of relatives and leave fresh flowers. If it was known that there were no family members left in the community, those graves also were cleaned. I don’t recall when I first began to hear, or think, that the day was intended to honor those fallen in war. Like many holidays, the original purpose has changed. Memorial Day, Independence Day, Labor Day, Christmas, Easter, and other holidays, have become times for picnics, trips, vacations, and assorted non-related practices. Every holiday has become a time for stores to have sales. I like the idea of Memorial Day. I am pleased to join in the remembrance of troops fallen in battle, and all of the dead who have played a significant role in my life. 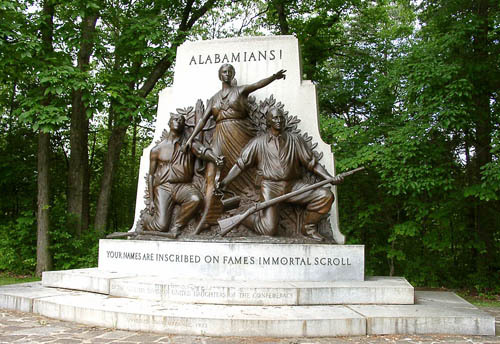 Honoring the Fallen from Alabama at Gettysburg. Photo by Ferrell Jenkins. Our header today is a photo I made at Normandy a few years ago. For Christians, every Lord’s Day is a special day of remembrance. We gather to remember the death of the Lord Jesus for our sins. 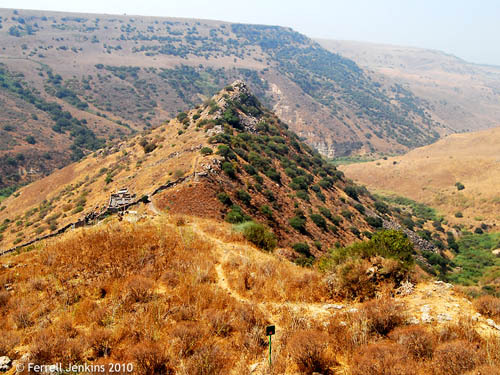 The nature reserve at Gamla has been severely damaged, according to a Haaretz report here. Israel’s nature and parks authority believed the blaze was started by a military tank, whose metal tracks gave off sparks when moving over rocks. A view of the site while reading the description by Josephus will probably be helpful. Gamla. Photo by Ferrell Jenkins. 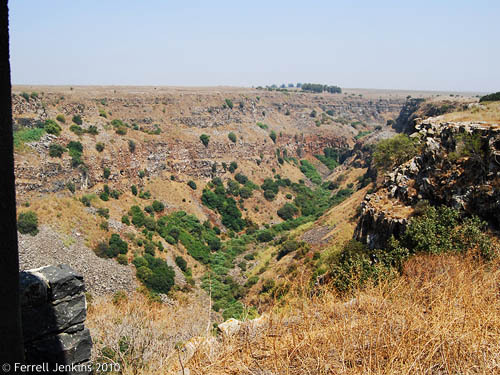 The photo below shows a canyon near the ancient site. 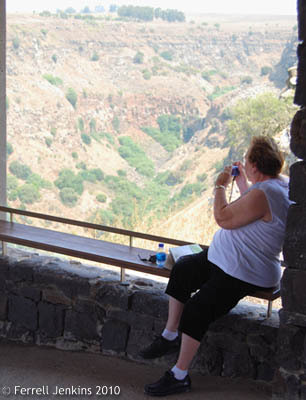 From this concrete lookout tourists look for soaring eagles which are common in the reserve. Looking for Eagles in 2008. 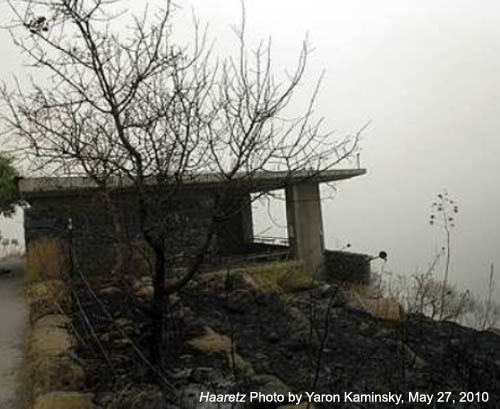 The photo below from Haaretz shows the same concrete observation building after the fire. Be sure to check the article to see more photos of the damage caused by the fire. Gamla Nature Reserve Fire. Photo: Haaretz, Yaron Kaminsky. This photo will give you a good view of the area as we saw it from the lookout near the end of August, 2008. Gamla Nature Reserve. Photo by Ferrell Jenkins, Aug. 30, 2008. Several years ago a friend who knew far more about computers than I did said to me, “It’s not if your hard drive will crash, it is when.” I have had at least two crashes, and my wife recently had one. As much as we depend on computers, we must realize that they are not eternal. For the past few years I have been using Mozy as a backup provider. I suggest you take a look. You can start with a free 2 GB, or sign up for the unlimited home plan for $4.95 a month. This is a cheap price to pay for even one significant file. Click on the image below to learn more. I will make a small commission if you click from here or on the image. I also use Dropbox, a service which allows me to synchronize files between computers. 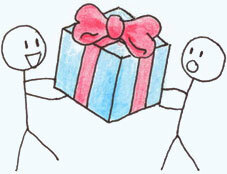 The Public folder, which allows the easy sharing of photos and other files, is also useful. A friend tells me that he has Dropbox on three computers (office, home, and laptop) so that all files stay up to date. By clicking from here you will get 2 GB free and a 250 MG bonus. Because I maintain the Biblical Studies Info Page, I don’t list a lot of links on this page. I suggest you check the Scholarly page, and then click on the Blogs and Photos. Here are a few sites dealing with archaeology and the Bible World that should be of special interest to readers of this blog. I am not listing the better known sites such as Bible Places Blog, Bible Places, and Holy Land Photos. Through the Land of Israel III. Laju Paul is publishing hundreds of photos from all over Israel. Photographs of Bible Lands. David Padfield, a friend who has traveled with me several times, has a great collection of photos available for download. Leon’s Message Board. Leon Mauldin, a friend who has traveled with me several times, is posting good photos of the Seven Churches of the Book of Revelation and other places he has visited. Bible Walks. Rotem, a young lady who lives in lower Galilee, has posted more than 2500 photos with maps, historical, and biblical information. Sacred Destinations. Religious and cultural sites around the world. 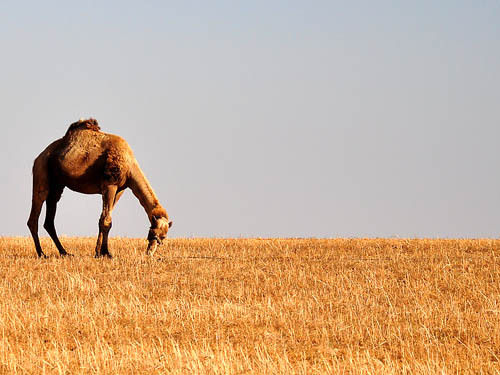 A camel along the road from Beersheba to Arad. Photo by Ferrell Jenkins. 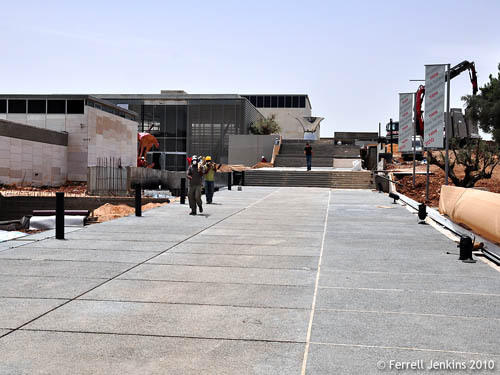 The Bible Places Blog reports here that the Israel Museum, after a lengthy and expensive renovation, is scheduled to reopen July 26. Twice, during the recent trip to Israel, I visited the grounds of the Israel Museum. The last visit to the Second Temple Model was ten days ago. At that time I made a few photos of the work going on outside the museum. 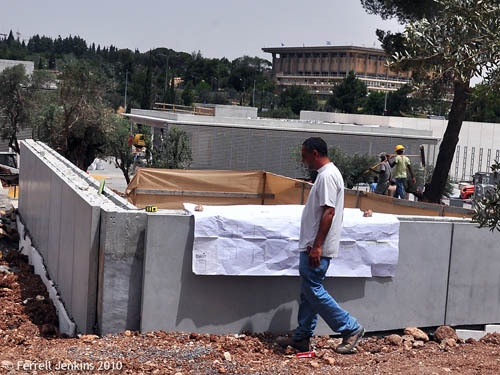 Construction at the Israel Museum - May 17, 2010. Photo by Ferrell Jenkins. From the outside the Museum looks much the same as before, especially the long, uphill walk to get to the entrance. Reading the Blueprint at the Israel Museum - May 17, 2010. Photo by Ferrell Jenkins. The already impressive location of the Museum campus with the Shrine of the Book, the Second Temple Model and the nearby Israeli Knesset building is sure to be even more impressive. I look forward to my next visit to Jerusalem when I may again see the wonderful exhibits inside the Museum. The great museums of the world with biblical collections, the British Museum, the Louvre, the Metropolitan in New York, the Istanbul Archaeological Museum, the Oriental Institute of the University of Chicago, the University of Pennsylvania, the National Museum in Athens, and the Pergamum Museum in Berlin, allow photographs of their exhibits. It would be great to see the Israel Museum follow the practice of these outstanding museums. Then, only the museums in Amman, Cairo, and Damascus would be out of step. A slide show of nearly photos of Ancient Egypt in Pictures is maintained at Fox News here. I have called attention to this before, but continue to receive the link from readers. In about two months the number of photos has increased from 47 to 58. I assume it may continue to grow as new discoveries are made. 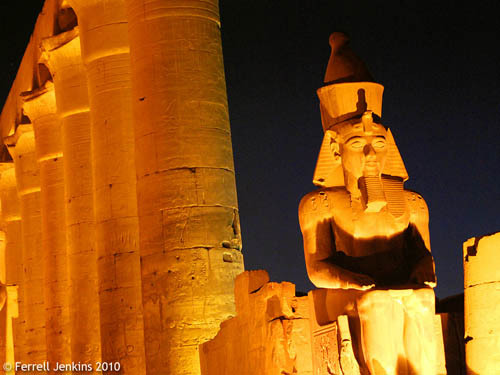 This gives me an opportunity to share a photo I made at Luxor in 2009. Rameses by floodlight. Luxor Temple. Photo by Ferrell Jenkins. A visit to the ruined and unoccupied temples of Karnak and Luxor, where Amon (or Amun) was worshipped as a great god, certainly convinces us of the fulfillment of this prophecy. Shortly after the time of Jeremiah (about 586 B.C. ), Egypt and Thebes began to decline as a world power. The weather changes every few days (or hours?) in Israel. One day may be hot and hazy, and another day may be cool and clear. The day our group went to the Sorek Valley and Beth-shemesh the sky was thick with haze. Two days later it was clear. Elizabeth and I went back to try to get a few photos to share with our group. We drove into the village (kibbutz) of Yishi to locate a good vantage point for the photo. It’s true that there are a lot of rooftops in the foreground, but it still gives us a nice view of the mound. Beth-shemesh from the west. Photo by Ferrell Jenkins. The Israelites took the ark of the covenant from the tabernacle at Shiloh to the battle field at Ebenezer when they were fighting with the Philistines (1 Samuel 4). The ark was captured by the Philistines and taken to Ashdod, then to Gath, and finally to Ekron before they decided to get rid of it. The ark was returned to Beth-shemesh (Beth Shemesh, Bethshemesh; 1 Samuel 4-6). 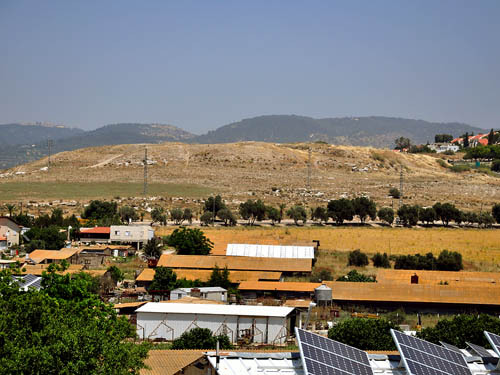 There is a small grain field between the row of trees and the first buildings of the kibbutz. This makes it easy enough to visualize the biblical event.